An original crochet amigurumi rabbit pattern by June Gilbank. These baby bunnies are so adorably tiny that they can sit in the palm of your hand - just like real baby bunnies! Details: Pattern includes full instructions to make 3 realistic baby bunny breeds: Dwarf, Angora, and Lop. Note: I used real angora yarn to make my white angora bunny, but you can make a fluffy angora-type bunny with standard acrylic/wool etc yarn too. 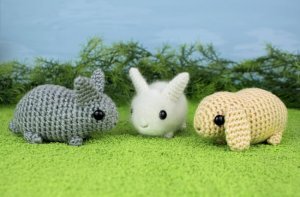 If you'd like to make a fluffy bunny, you'll need a wire pet slicker brush to brush out the pieces after crocheting (instructions are given in the pattern). Date Added: 12/07/2018 by Kimi W.
Date Added: 04/11/2015 by Elizabeth C.
Date Added: 03/27/2015 by Rachel G.
Date Added: 07/21/2014 by Stacey H.
This pattern was easy to follow and is super cute! I can't wait to make the other bunnies! Date Added: 06/19/2014 by Jessica C.
Date Added: 04/25/2014 by Heather R.
Date Added: 01/14/2014 by Peggy G.
LOVE! These bunnies are so cute, and so quick to work. I have done two so far, with more planned. Date Added: 01/11/2014 by Claire F.